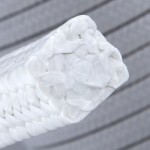 Style 426 is an interlock braided mechanical packing of silky PTFE fiber in combination with heat conductive fiber. Style 426 has a high thermal conductivity. Style 426 is suitable for pump, valve, stirrer, tank cap and similar applications. Manufactured by FDA approved raw materials.